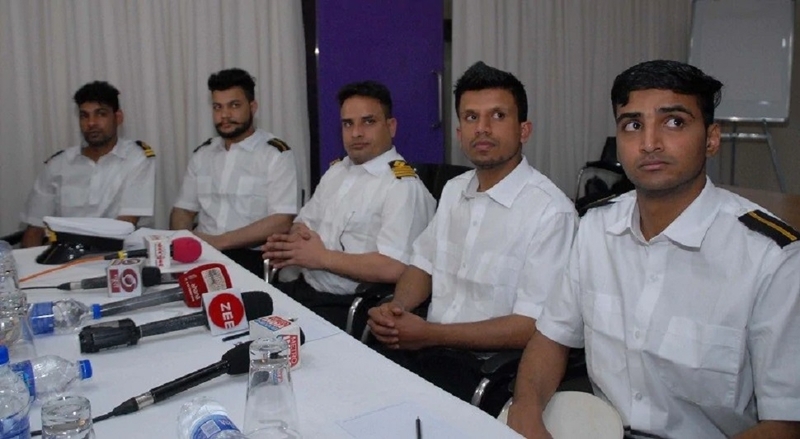 FIVE Indians, who spent over 14 months in a Greek jail after their cargo ship was detained on charges of carrying explosive material on board, arrived in Mumbai on Sunday morning. MV Andromeda was detained by the Greek Coast Guard on January 9, 2018. Although it was established that the cargo in question was only a raw material for firecrackers, the crew of the ship had to languish in jail for over a year. The ship had set sail from Turkey on January 6, 2018 and was headed for Djibouti when it was diverted to the Greek coast for repairs and later, detained by the coast guard. “The explosive material was legal. Local authorities did not go through the documents which the Greek ship owner had,” Bhupendra Singh, one of the Indian crew members who returned home Sunday, told the media here. “We were given consular access and they (the Indian embassy staff) were very supportive and were present at every hearing,” said Singh, a native of Gurudaspur in Punjab, adding that they were not subjected to physical torture in any form. Singh, however, said he had to undergo mental agony “especially when beef was served frequently.” “There were few times when I thought of ending my life. I was the only son of my father...I could not be present in my sister’s wedding,” he added. Another crew member, Gagan Deep, who is from Bengaluru, said jail authorities informed them that they were the first Indians to be lodged in the jail since it was built in 1953. Gagan Deep claimed that he had not been paid salary for the last 23 months by the company which owns the ship. Interestingly, it was the Pakistani inmates lodged in the the jail who provided them emotional support, he said. “Whatever grudge we may hold against each other’s country, but when we meet each other in other countries, we (Indians and Pakistanis) understand each other very well ... Those two Pakistanis helped us a lot in every way,” Bhupendra Singh said. The other three Indian crew members are Rohtas Kumar, Jaideep Thakur and Satish Patil. They will meet officials of the Union Shipping Ministry on Monday and apprise them of the entire episode. Amar Singh Thakur, General Secretary of the Maritime Union of India (MUI), said a court in Greece ruled a fortnight ago that the explosive material on board the ship was raw material for crackers, and not a banned explosive material. MUI, a city-based union of shipping workers, helped the crew members in their legal battle, he said.